With a little imagination, some recycled items, and the help of a U.S. company called Toysmith, kids can construct their own robots, rockets, and necklace beads. These DIY kits make a unique gift for curious minds and hands-on fun. Meet Bob—ordinary soda can turned walking wobbling robot in less than 45 minutes with the Tin Can Robot kit. Then, there’s the Green Rocket that can launch up to 80 feet in the air. All you need is a magazine and a couple of plastic bottles to let the countdown begin. Who knew the science of robotics and aeronautics could be so entertaining? For artistic types, the Recylced Paper Beads kit lets you make jewelry out of colorful craft paper (included) or old newspapers and magazines. Insert strips of paper into the tool, turn the handle, and paper becomes your new favorite accessory. Attach the tool to a plastic bottle and you’ve got yourself a container to catch and store your beads as you craft them. 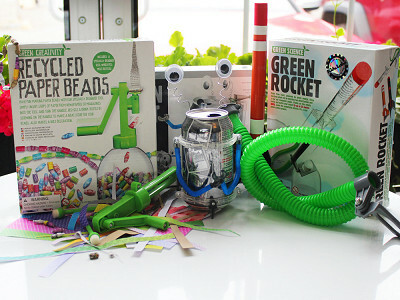 Designed for kids as young as eight, but we think tweens, teens, and even grownups will get a kick out of seeing how things work and bringing new life to recyclables with these innovative kits from Toysmith. 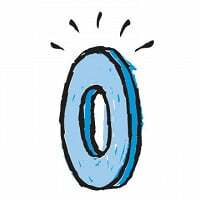 Amy from The Grommet here filling in for Toysmith today. We hope you are as excited as we are for these invention kits today. Looking forward to your questions and comments. 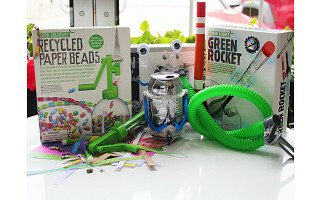 With a little imagination, some recycled items, and the help of a U.S. company called Toysmith, kids can construct their own robots, rockets, and necklace beads. These DIY kits make a unique gift for curious minds and hands-on fun. Meet Bob—ordinary soda can turned walking wobbling robot in less than 45 minutes with the Tin Can Robot kit. Then, there’s the Green Rocket that can launch up to 80 feet in the air. All you need is a magazine and a couple of plastic bottles to let the countdown begin. Who knew the science of robotics and aeronautics could be so entertaining? For artistic types, the Recylced Paper Beads kit lets you make jewelry out of colorful craft paper (included) or old newspapers and magazines. Insert strips of paper into the tool, turn the handle, and paper becomes your new favorite accessory. Attach the tool to a plastic bottle and you’ve got yourself a container to catch and store your beads as you craft them.